Spielen Sie Ihre Musik kabellos über Bluetooth ab und genießen Sie den raumfüllenden Sound. Schließen Sie bis zu 3 Smart-Geräte gleichzeitig an und spielen Sie abwechselnd Musik ab. Der integrierte Lithium-Ionen-Akku bietet genug Strom für bis zu 8 Stunden Musikgenuss und lädt Ihre Geräte und Tablets über den USB-Anschluss auf. Die Harman Echo- und Rauschunterdrückungstechnologie bietet kristallklare Konferenzgespräche. Verbinden Sie zwei Dual-Sound-fähige Harman Kardon Lautsprecher kabellos miteinander und erhöhen Sie so Ihren Musikgenuss. Stoffveredelung und Edelstahlgriff betonen Ihre Inneneinrichtung und passen zu Ihrem mobilen Lebensstil. 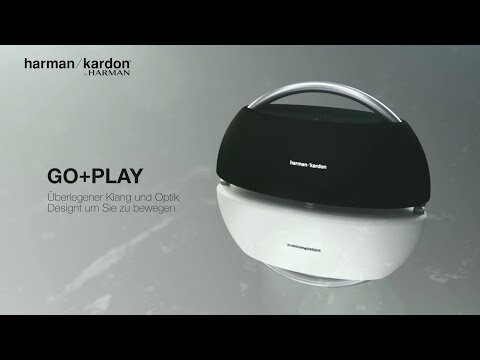 Das charakteristische Design von Harman Kardon trifft in diesem leistungsstarken, voll ausgestatteten, tragbaren Bluetooth-Lautsprecher auf überlegene Funktionalität: der Harman Kardon Go + Play. Mit seinen vier Treibern erfüllt er den Raum mit einem vollen Klangspektrum. Sein wiederaufladbarer Akku bietet bis zu 8 Stunden Musikgenuss und erlaubt Ihnen, Ihre Smartphones und Tablets über den USB-Anschluss aufzuladen. Verbinden Sie zwei Dual-Sound-fähige Harman Kardon Lautsprecher kabellos miteinander und erhöhen Sie so Ihren Musikgenuss. Der Go + Play ist ebenfalls aus hochwertigen Materialien hergestellt - sein Edelstahlgriff und Gitterstoff fügen Ihrer Inneneinrichtung oder Ihrem mobilen Lebensstil eine geschmackvolle Note hinzu. Go + Play wurde bewertet mit 4.7 von 5 von 422. 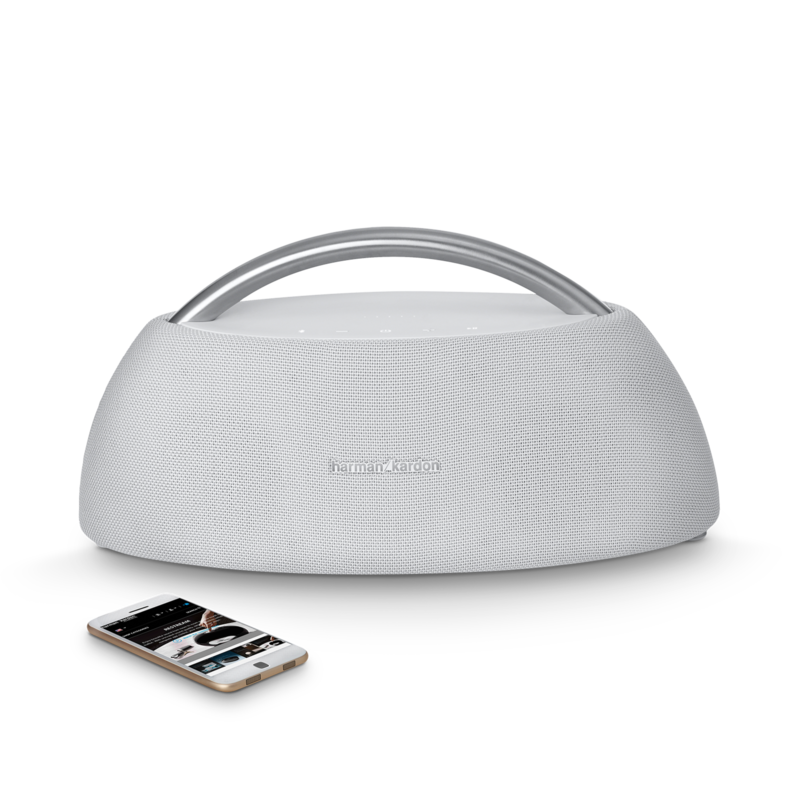 Rated 5 von 5 von Hmac71 aus Buy it I bought the white one as a garden speaker a few weeks ago. My partner came in from work and couldnt believe the sound. We sat in our kitchen for three hours playing songs to hear how amazing they sounded on this. We have a Homepod which we thought was quite powerful, this blows it away with its range and clarity. Everything is crystal clear, you can hear the lyrics in songs much clearer than anything else we own. I have also been using it in the garden to stream music and radio, and cannot fault it. Battery seems to last for ages, and when turned up high outside (we have no neighbours), the power is still very much there. Rated 5 von 5 von Addison 2004 aus This speaker is absolutely amazing About 1 and a half years ago from now I bought a JBL Xtreme. It lacked in bass and it distorted badly in the bass however seeing as jbl is made by harman kardon I thought I would try one it came and I switched it on and it sounded about 10 times bigger than what it was and I’m only 14 giving this review but to be honest it made the JBL Xtreme suond like a toy. The bass is dynamic and the tweeters give off very brittle quality. This speaker is absolutely boss don’t even bother with bose or jbl or ue boom n all that rubbish absolutely amazing. Rated 5 von 5 von TomsGrandpa aus Party winner Bought this for my wife who is a music loving 70 year old and she just loves it. Looks like a hand bag and comes with a big punch of sounds. We used it for her birthday party in an hotel private dining room and my daughter sent the music from her Kindle which was easy to pair with the Harmon. The sound quality is amazing, filled the room so much that people ended up dancing. Bass is fantastic and the mids and top are clear as a bell. A big hit with my family. Rated 5 von 5 von albertojedi aus Outstanding! Received it a week ago and still amazed. Bass response varies heavy with the location but when you find a sweet spot (usually in a corner) it can beat or match a true subwoofer. No distortion. I own an Optimum 12 subwoofer and this little bluetooth speaker plays more agile than it. Really impressive. Only thing I have not been able to do is pair it with my Windows 7 laptop. I am unable to find compatible drivers. Any suggestion from Harman would be appreciated. Rated 5 von 5 von leenicknak aus nice size great sound bought this after reading reviews I was after a good sounding blue tooth speaker for the house.this fits the bill spot on great for around the house garden etc. sound quality is great nice rich all round sound from a single unit. I ummed and arrrred for a few weeks then they reduced the price but after hearing it I would of been happy paying full price so if your looking for a speaker in this price bracket hesitate no more and part with your money you won"t be disappointed. 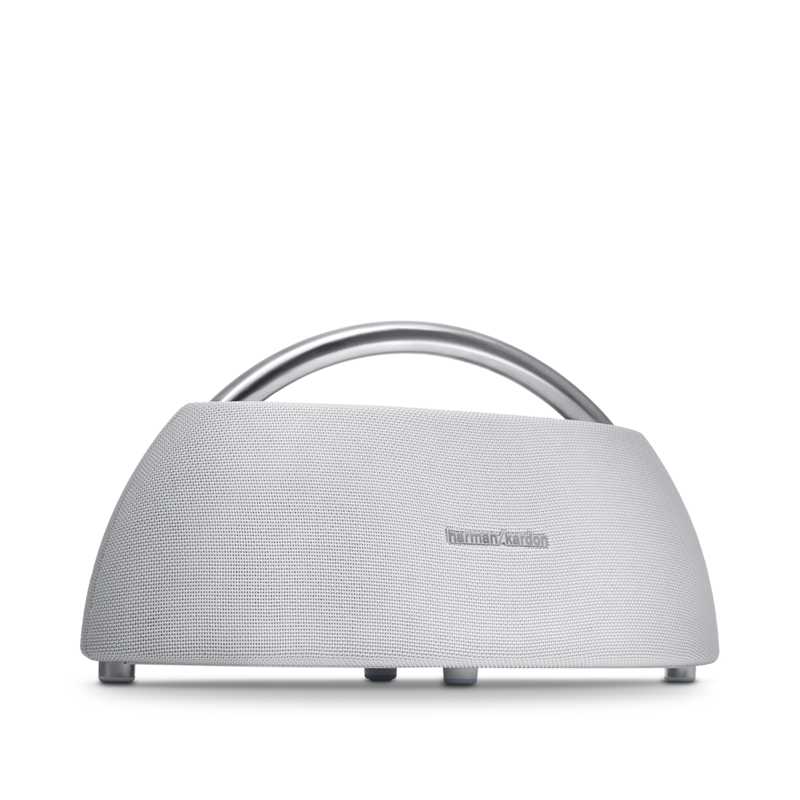 Rated 5 von 5 von tagusloverslisbon aus overwhelming Best speaker I bought in the last 2 years! Use it on my sailing boat since I bought it and is performing awesome! Overwhelming bass, awesome expansion outside (I’m very sensitive to sound quality) and super resistant materials! Stands permanently on my sailing boat for 2 years now and no signs of rust! I have a Zeppelin at home and this one the boat and I can tell you that, for 1/3 of the price, this was the best gadget I bought last 2 years. And look carefully! I have ropes on the handler because I use it outside while sailing (while sailing the boats tilts a lot so we neeed to hold everything)! It often gets sprays of salty water! Any other speaker would be dead in less than 6mo! People used to be on the water knows what I’m talking about! thank you very much and keep the good working. Keep the dream: there is people outside which would pays for quality. 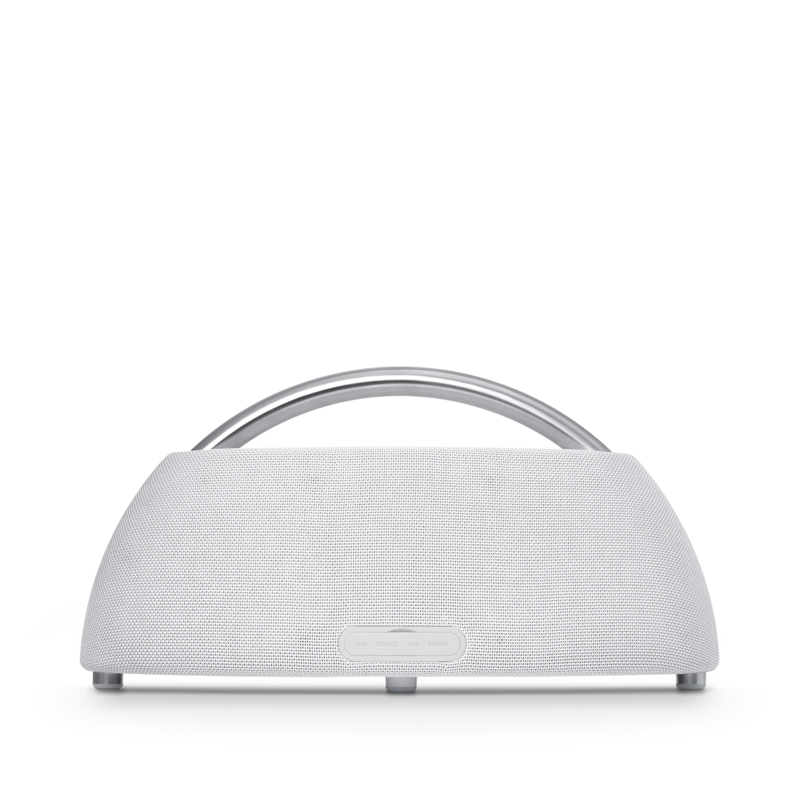 Rated 5 von 5 von Jakub aus Best sounding portable speaker I love HK product's. I had first go play and the only thing i hate about it were D-cell batteries. After that i bought onyx for its size and also integrated battery. When i heard next generation of go play will be with rechargable battery it was must have product and no dissapointment here at all. Really amazing. I look forward to go play 2.